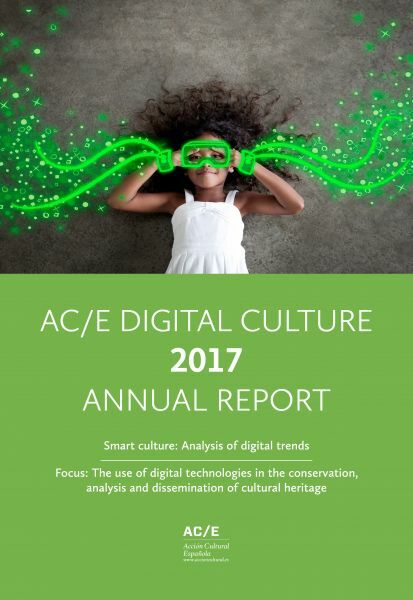 Acción Cultural Española's fourth edition of the AC/E Digital Culture Annual Report follows an editorial policy of familiarising professionals of the culture sector with the main digital trends they need to be aware of over the coming years. Since 2015, a committee has been advising us on the choice of subjects and authors for the first part of the report. This year, a group of experts analyse issues such as content curation as a means of tackling digital overload, neuroscience applied to technology, the latest advances in artificial intelligence, the Internet of Things and Big Data applied to culture, and the use of digital technology in music. Each year's edition also includes a field study: the Focus, which reports on cases of good practice in digital technology in a specific discipline. The first edition examined the impact of digital in the world of the performing arts; the second focused on museums; and the third on the use of digital devices at fifty Spanish and international culture festivals. This fourth edition surveys in depth the use of digital technology in the conservation, analysis and dissemination of our cultural heritage. This sector is rapidly growing, leading to a radical change in methodologies and formats which the author, David Ruiz Torres, analyses exhaustively.